I'm currently working on a small App, the whole conception and dev are driven by planning and budget. I'm trying to create a this display, showing many insurance operation to users. 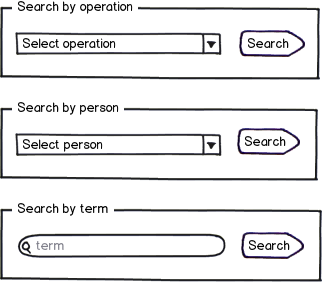 Users can filter this operation by two parameters (type of operation, people concerning by the operation) or via a search input but, Only one of these three filters can be used at once. I'm stuck at this point: How should I visually represent to users that they have to choose ONLY ONE filter, even if they are functionally different (search/real filter)? since you're in the mobile environment, you can try something similar to tabs. however, when you design the graphics for this, do make it look better than regular tabs. this way it is very clear you can choose only one way to filter. Looks like a radio button would be fitting here. Radio buttons are designed so that only one option can be active at once. On mobile, you could surround each radio button "section" with color or variable saturation or lightness, or gray-out other input fields when their group is not selected. The circle in radio group should be clear enough indicator to users that only one option can be active at a time. Don't select anything at first. This will let user choose what they want. It would be wise not to gray out anything at first, or the user might think nothing is editable. 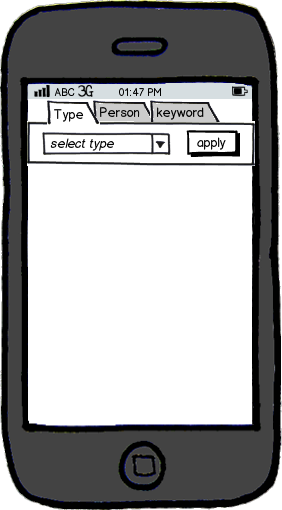 Test your app and pre-select one option the user is most likely going to use. Not the answer you're looking for? Browse other questions tagged mobile lists filter or ask your own question. How to display included/excluded applied filters?